Woollahra Library at Double Bay hosted an exhibition of selected works completed by artists as part of the 2016 Woollahra Artist in Residence Program, as well as works created or contributed to by more than 180 local residents during community projects hosted by resident artists. Participating artists with individual works include Penelope Metcalf, David Asher Brook, Eloise Rankine and Fiona Hueston. This series featured 59 portraits of people using the Woollahra Library, Double Bay, in the months of September and October 2016. All portraits were presented without names to keep those who participated anonymous, like faces in a crowd, or as one might experience the quiet space of the library. A community tree installation created from donated hearts, constructed in a paper sculpting workshop. A stop motion video put together from more than 100 library users contributing to a community painting. Selected works of class participants Jo McNiven and Carolyn Neumann, captured on smart devices. 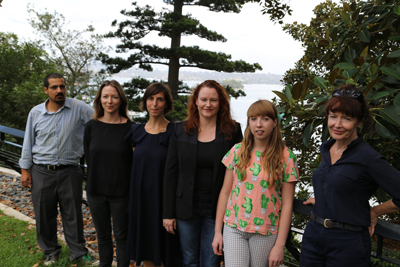 Woollahra Council welcomed seven artists to the 2016 Artist in Residence Program based at the EJ Ward Paddington Community Centre. The seven participating artists were Fiona Hueston, David Asher Brook, Penelope Metcalf, Stella Rosa McDonald, Eloise Rankine, Leyla Stevens and Rafaela Pandolfini. After applying for the residency, the artists were chosen by a selection panel from Council's Cultural Committee and have embarked on their nine month residency which will conclude in December 2016. Each of the Artists in Residence delivered a community project and participated in studio open days, talks and public workshops. Council also retained examples of the community work they produce. The residencies lastrf for nine months, with work spaces and shared facilities provided rent-free by Council at the EJ Ward Paddington Community Centre. 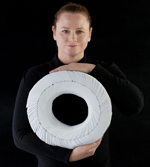 Fiona Hueston is a multidisciplinary artist whose work includes sculpture, installations and photography. Fiona was selected as a 2015 finalist in the internationally renowned Woollahra Small Sculpture Prize. As part of her community project, Fiona is investigating her neighbourhood of Paddington in new ways and photographing interesting aspects of it. She also asked the local community ti contributed their own images and insights on Paddington via Fiona's social media page. All images were then printed and folded to create a unique sculptural work called ‘Habitat’, which was displayed in Woollahra Library at the conclusion of the residency. Fiona also held paper folding workshops for 7 to 13 year olds as part of the December School Holiday Program at Woollahra Library. Visit Fiona Hueston's website for further information. David Asher Brook is a visual artist working primarily in painting and video art. He has been a three times finalist in the NSW Parliament Plein Air Painting Prize. His Wynne Prize entry in 2015 was selected for the Salon des Refuses. David’s video art has been screened at the Institute of Contemporary Arts London, twice in the Blake Prize Director’s Cut Exhibition Sydney, at the Altered States Film Festival UK, in dLux Media Arts “Is this Art” program and won the Golden Ghetto first prize in Gallery Levantina Venice. For his community engagement project, Woollahra Library users were invited to participate in a contemporary, collaborative art project directed by David. Participants were invited to add several strokes of paint to a canvas as they were photographed at intervals to create a stop-motion video artwork. Visit David Asher Brook's website for further information. Penelope Metcalf is a visual artist and painter and been represented in numerous awards, competitions and exhibitions. 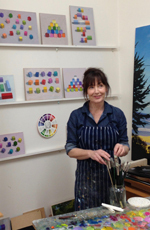 Her art practise focuses on en plein-air painting. Recently, she was commissioned to sketch a series of cartoon panel recaps of Mad Men that were published in The New Yorker. For Penelope’s community project, she delivered a series of workshops called ‘Digital Finger Painting’, during which participants used the app Brushes on their smartphone or tablet. Starting with fundamentals of digital painting and moving on to simple painting and composition techniques, participants worked towards completing a digital painting of a still life. Visit Penelope Metcalf's website for further information. Stella Rosa McDonald is a video artist based in Sydney. Her practice examines the various influences of language, text and image on the portrayal of historical matter via artistic and literary abstraction. Stella facilitated the community project ‘Reading Writing’, a monthly reading group that explored the history of the written word in art. Eloise Rankine works in a range of media including ceramics, drawing and embroidery. Her work explores ideas surrounding the fragility of the domestic experience by exploring ideas of beauty, nostalgia, comfort and the concept of home. 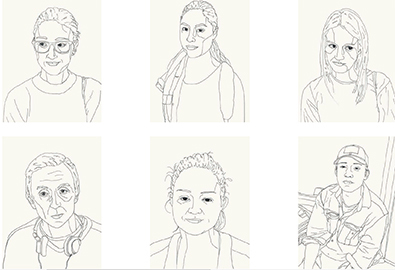 As part of her community project, Eloise will undertook a project called ‘Local Faces’. This involved participants being photographed and their image being translated into an expressive hand drawn digital sketch. This technique brought together traditional drawing techniques and new technology to present a series of sketches of the general public who visit, live or work in the Woollahra local council area. The final works were presented anonymously, with participants encouraged to find themselves within a vast array of others, as if trying finding oneself in a crowd. The project was presented as a limited edition prints, a small-format book and on a digital platform. Visit Eloise Rankine's website for further information. Rafaela Pandolfini is an interdisciplinary artist working predominantly in photography, video and more recently dance and ceramics. She is interested in the possibilities of expressing emotion as form through performances involving movement, costume and sounds. As her community project, Rafaela conducted a five week course called ‘Art for your Smartphone’. Participants used their smartphone, tablet, DSLR or film camera to produce photo and video works, following theoretical and practical lessons that aimed to provide visual stimulation and enhance participant’s artistic style. Visit Rafaela Pandolfini's website for further information. 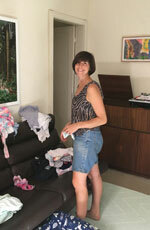 Leyla Stevens has been exhibiting within Australia and internationally since 2005. She was selected for the 2014 NSW Visual Arts Fellowship (Emerging) at Artspace, the 63rd Blake Prize at UNSW Galleries and the 2014 SafARI Biennale. 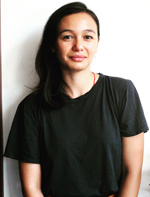 In early 2015, she was awarded a Skills and Development (General) grant through the Australia Council for the Arts which she used to undertake an artist mentorship program in Yogyakarta, Indonesia. As part of Leyla’s community project, ‘The Reading Room: privately reading in public space”, she researched and created an audio-visual documentation of the new Double Bay Library. Her project was based on interviews, photos and her own reflections. Visit Leyla Stevens' website for further information.